St Paul's: Central Line, 1,100 metres approx. Blackfriars 300 metres from the South exit; 800 metres from the North exit. The Tate Boat runs every thirty minutes along the Thames between Tate Britain and Tate Modern. Other river services run between Millbank Pier and Bankside Pier. Cycle Hire Docking Stations are located on New Globe Street and Southwark Street. A drop off / pick up point is situated on Holland Street, just outside the main entrance. There are no parking facilities at Tate Modern or in the surrounding streets. Public transport is the easiest way of getting to the gallery. A drop off / pick up point is situated on Southwark Street, a short walk from the main entrance. Our in-gallery team can help you get the most out of your visit. Whether it is how to plan your day or to share stories, ideas and opinions about the art on display, do ask us. Entry to Tate Modern is free for everyone with a charge for special exhibitions. Visitors with a disability pay a concessionary rate, and entrance for companions is free. Tate Members and Tate Patrons get free entry to special exhibitions. Visitors aged 16–25 can join Tate Collective to access £5 exhibition tickets. Under 12s go free (up to four per parent or guardian) and £5 family child tickets are available for children aged 12 – 18 years. There is a left luggage facility at Waterloo station. Last admission and ticket sales for special exhibitions Sunday – Thursday is at 17.15 and 21.15 on Friday – Saturday. Ticket desks close at this time. There are twelve parking spaces for disabled visitors to Tate Modern, accessed via Park Street. Please book these spaces in advance, giving at least 24 hours notice. Once you have parked, please enter via the South Entrance of the Blavatnik Building across the level terrace, approximately 30 – 60 meters from the parking spaces. Two RADAR Key operated lifts link the South Entrance on Level 1 and the Ticket desks in the Turbine Hall and the cloakroom on Level 0. RADAR keys are available from staff at the South Entrance on Level 1, and from the cloakroom and ticket desks on Level 0. If you have booked a mobility scooter or wheelchair, these can also be collected from the South Entrance. Tate Modern is a very large gallery with two interconnecting buildings, Natalie Bell Building and Blavatnik Building. Visiting all galleries involves moving around on different floors and buildings, across indoor bridges. Lifts are available on each level. Visit our Wheelchair and Mobility Scooter Provision section for more information. There are five entrances to the gallery. There is a ramp into level 0 of the gallery. A flight of steps with a handrail runs alongside the length of the ramp. From here, there is escalator, lift and stair access to all levels. The river entrance provides access directly to level 1. From here, there are lifts and staircase to all floors in the Natalie Bell Building. The entrance is located on the south side of the building and it provides access directly to the Terrace Bar and Terrace Shop. From here, there are lifts to all levels in the Blavatnik Building and access to the Natalie Bell Building via Level 1 Bridge. The two parts of the Tate Modern building: Natalie Bell Building and Blavatnik Building are connected on Level 0 through the Turbine Hall, Level 1 Bridge and Level 4 Bridge. Two RADAR Key operated lifts link the South Entrance on Level 1 and the Ticket desks in the Turbine Hall on Level 0. RADAR keys are available from staff at the South Entrance on Level 1, and from the cloakroom and ticket desks on Level 0. There is an additional entrance to the Café on Level 1 next to the Turbine Hall entrance on Holland Street. The two parts of the Tate Modern building: Natalie Bell Building and Blavatnik Building are connected on Level 0 through Turbine Hall, Level 1 Bridge and Level 4 Bridge. All entrances are accessible for wheelchairs, prams and buggies. If you wish to borrow a mobility scooter please book in advance giving at least 24 hours notice. The reservation is free. You must have driven a mobility scooter before to use one at Tate Modern. Please note your name, contact details, date and time of visit are required to make the booking. Information desks are located near the River entrance, in the Turbine Hall and in the Clore Welcome Room on Level 0. Staff are happy to help with any questions you have. Fully accessible toilets are located on every floor, on the concourses. A Changing Places toilet is available on Level 0 Natalie Bell Building. Visitors can access the toilet using their RADAR key. RADAR keys are available from the cloakroom and ticket desks on Level 0, and from staff at the South Entrance on Level 1. The Baby Care Room is located on Level 0 Natalie Bell Building. Additional nappy-changing facilities are available in all toilets on each floor. There are four lifts in the Natalie Bell Building part of the building situated by the main stairs on each floor. You can reach the lifts from the River entrance, the Turbine Hall entrance and the Café entrance . The cloakroom is located on level 0 Natalie Bell Building. The service is free of charge. Self-service lockers are located in the Tanks lobby on Level 0 Blavatnik Building. The use of the lockers is free of charge with the requirement of a £1 deposit. There are seats and benches throughout Tate Modern galleries, Turbine Hall and the concourses. Folding seats are available – just ask a member of staff or pick up a stool from the racks located on the concourses on levels 2, 3 and 4. There is a card and cash pay phone on Level 1 in the Natalie Bell Building, under the staircase in the lift lobby. Staff at the Information desks will call the Dial-a-Ride service for visitors. There are water fountains by the toilets on levels 2, 3 and 4 in the Natalie Bell Building. There are no water fountains in the Blavatnik Building. The Kitchen and Bar on Level 6 Natalie Bell Building and the Restaurant on Level 9 Blavatnik Building are both accessible via lifts. Both have waiter service. 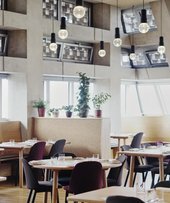 Café on level 1 Natalie Bell Building and the Terrace Bar on Level 1 Blavatnik Building are accessible from street level. The Espresso Bar on Level 3 Natalie Bell Building is accessible via lifts in the Natalie Bell Building. All are self-service, but staff are happy to help if you need assistance. The Members Room is located on Level 8 Blavatnik Building. Lifts are available on every floor. The Members Bar is located on Level 5 Natalie Bell Building. Lifts are available on every floor. 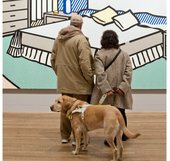 Admission to Tate Modern is free, but there is a charge for the majority of exhibitions. The ticket desk is in the Turbine Hall on Level 0. Consider purchasing your e-ticket in advance on the special exhibition page and show it at the exhibition entrance. No booking fee. We welcome guide dogs. A drinking bowl is available at the cloakroom on level 0 – just ask a member of staff. Large print exhibition guides are available at all special exhibitions at Tate Modern. Please ask at the exhibition entrance. Large print guides for the special exhibitions are also available on our website: visit the relevant exhibition page and click on the blue box 'Read the exhibition guide' half way through the page; click on the 'Download large print guide' button near the top of the page to read the guide or to save a copy to your device. Touch Tours introduce visually impaired visitors to the thematic arrangement of the displays. Tours engage with the ideas, materials and techniques of the art on display. 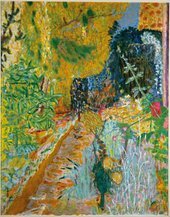 Audio described tours explore works on display in the permanent collection and exhibitions. Tours take place seated in the gallery and are delivered by visually impaired artists. Hearing loops and amplifiers are available. Audio described tours at Tate Modern occur 4 times a year. Each tour lasts around one hour. Please join us in the Community Room (in the Blavatnik building, next to Terrace Café) for tea and coffee from 15.30 before the tour. We also have an online audio description tour for key works at Tate Modern. Join our BSL talks to discover works on display in the permanent collection and the special exhibitions. Tate trained guides deliver tours at Tate Modern in spoken English with British Sign Language interpretation. Hearing loops and amplifiers are available. BSL Talks at Tate are free. No booking required. Tate Modern offers a range of free talks and workshops which are available to relevant groups through Tate Modern’s community programme. Large print captions are available in all special exhibitions. Ask at the exhibition entrance. As part of the Hyundai Commission: Tania Bruguera installation there is a sound system in the Turbine Hall that produces low frequency sound. Because the sound frequencies are low some people can feel the sound bodily when they stand or pass through certain areas of the hall. The ear defenders available from the Information desks might not help with the bodily sensations of the sounds. If you prefer to bypass the installation, we recommend using the Blavatnik Building entrance. The Blavatnik Building is generally quieter than the Natalie Bell Building. The River Entrance gives direct access to Level 1 Information Desk where visitors can pick up ear defenders. It also gives direct access to the Turbine Hall and the installation. For more information in advance of your visit, contact the Information team - call +44 (0)20 7887 8888 (09.00–18.00 daily) or email information@tate.org.uk. Our phone line supports the use of speech recognition apps. Tate Modern offers events and workshops for a wide range of community groups. Attendees currently include mental health service users, people who experience homelessness, adults with learning difficulties and ESOL (English as a Second Language) groups.